Subscription-based businesses are on the rise. Numerous organizations that have previously used the pay once, use forever model, are now switching over to the subscription business model. This is because there are many advantages to billing customers on a recurring basis. With a recurring billing model, your business could see substantial and sustained growth as well as higher revenues and customer lifetime values (CLVs). This helps you to scale your business easier and faster. So what are the advantages of subscription-based pricing? 1. Subscription-based pricing attracts more customers. Charging customers $25 per month is more attractive to consumers than charging them $500 at one shot. This is because the higher price is a barrier to entry for your products. There are exceptions but in general, the more expensive your product is, the fewer customers will be able to make the purchase. Subscription payments lower the barrier to entry for products and services and allow more potential customers to purchase your product. While they may pay a larger amount over the long term, they can get immediate access to the product. They also enjoy the increased benefits you can provide as your business grows and you improve your products over time. Since you are not impacted by the cost of shipping items and may have the flexibility to accept all kinds of payments, global markets are easier to reach. Even in the case of enterprise deals, the lower price point may allow you to fly under the budget threshold radar and help you avoid long sales negotiations with procurement teams. All this promotes the growth of your monthly recurring revenue (MRR). 2. Recurring billing offers predictable revenue. When you are operating a pay once model, you must constantly attract and convert customers in order to earn revenue. This can be expensive. One poorly performing month could set you back and it can be harder for you to recover the investment you already made toward customer acquisition. With a subscription-based business model, customers make payments to you on a regular basis. Since the amount of recurring payments is decided on at the time of initial sale, it allows you to predict your revenue each month. This also ensures that you aren’t ordering more supplies or stocking more inventory than you need. With billing automation for recurring billing, there are fewer gaps between billing cycles. This helps plug revenue leaks. The revenue stream from recurring subscriptions is much more than a one-time purchase too. This guide will walk you through the wide range of features required to automate your recurring billing, subscription management, and payment processes. 3. Subscription billing increases return on customer acquisition costs. One-time payment models have a set rate of return on your customer acquisition cost (CAC). With the subscription model, however, there is no standard return on this key measure. This is because while CAC will remain similar (depending on marketing and conversion route), the CLV will increase depending on how long they stay with your organization. The length of time customers remain subscribed can vary, but subscription-based businesses are rewriting the book on retention and management of ongoing relationships. Resources to create life-long customers become more available every day. Reducing the customer churn rate is a mission-critical aspect of leveraging this specific advantage. 4. You can earn more through up- and cross-selling. Because you have continuous contact with your client base, you are building a strong bond of trust. This makes it easier to market additional and complementary services. Upsells are usually easier with a subscription business since the customer has a prior relationship with your business and will be receptive to any added value you can provide. Additionally, once subscription fees have become a part of consumers’ expected monthly or annual budget, it becomes easier for them to see additional features as more affordable. This is especially true for customers using your subscription to learn and/or grow, who may find that add-ons enable them to achieve goals more efficiently. Various pricing models like tiered pricing, volume pricing, etc., can allow customers to easily move up the upgrade path when they are ready. 5. Easy to offer a proof of concept. With one-time payment systems, it’s difficult to offer a trial period or taster session. Even with a free trial, the full price of the item could be a potential deterrent to a sign-up. Subscription-based products and services make this much easier, allowing you to provide free versions in the hope of enticing clients into subscribing to the full package. Unlike in a physical product, you can deliver your product instantly. This may require more work, but it is beneficial in several ways. Even if the customer doesn’t sign up immediately, they are likely to have provided you with their contact details, which can be used to email newsletters and/or promotions that may convince them to sign up later. Customers also benefit from the fact that the product is always up-to-date, allowing them reduced time-to-value for any new features implemented in the product, maybe even when they are in the ‘trial’ version of the product. Subscription-based pricing is an increasingly popular business model. This type of pricing allows you to offer affordable, high-quality products that improve with time, thanks to the emphasis on longer customer relationships and recurring revenue. Subscription pricing presents advantages to both your business and your clients so that everybody wins. 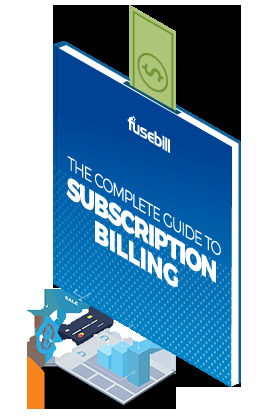 Fusebill simplifies subscription and billing management by automating many manual accounting and financial processes and workflows. Our cloud-based platform gives companies the freedom to grow their businesses, the flexibility to capitalize on new product opportunities, and the agility to maintain a competitive edge.